Without question, any Christian holding strongly to a biblical worldview would agree wholeheartedly with point #3. The glory of God is the supreme chief end of all that God does and as is stated in 1 Corinthians 10:31 should be the primary goal of all that we Christians do as well. Point #2, while on the surface would get a rousing ‘Amen’, should be analyzed more closely as to what exactly is meant and then understood that the context of a passage dictates the interpretation and not vice versa. For instance, in Psalm 50:10 the Lord says, “For every beast of the forest is mine, the cattle on a thousand hills.” If read “literally” apart from context, then we are left with the cattle on hill 1001 belonging to someone else. That’s not the case here, as this reference was to simply prove a point that the magnitude of God’s “ownership” over His creation is immense. Similarly, much of the prophetic passages in the Bible use imagery, visions, and other language to describe future events. An example would be Revelation 13:1-3 “And I saw a beast rising out of the sea, with ten horns and seven heads, with ten diadems on its horns and blasphemous names on its heads. And the beast that I saw was like a leopard; its feet were like a bear’s, and its mouth was like a lion’s mouth. And to it the dragon gave his power and his throne and great authority.” Taken in a strict literal sense apart from context, the end times would be marked by a beast that resembles something out of a science fiction movie, rather than having prophetic meaning behind the imagery that is used here which lends itself to a better understanding of who this individual Antichrist might be. The classic dispensationalist, ala Ryrie, is then forced to decide, are they to stick with a wooden literal interpretation from Genesis to Revelation and force a meaning into Scripture, or are they to let context and the author’s original intent, i.e. literary genre, determine how the passage of Scripture is to be read. This of course is not to deny that the Bible is the literal Word of God, nor does it mean that when Jonah describes being in the belly of a fish he actually is using imagery. No, it was a literal fish and again, context must reign. Allegorizing God’s Word is a dangerous error and as has been pointed out even though multiple writing styles (poetry, prophesy, parables, etc.) are utilized it must be understood that the Bible is to be interpreted literally within its context. For a discussion on dispensational use of “literal interpretation” see the article by Vern Poythress, “What is Literal Interpretation?” found here: Monergism – Dispensationalism. “Distinctions have been drawn by certain exceedingly wise men (measured by their own estimate of themselves), between the people of God who lived before the coming of Christ, and those who lived afterwards. We have even heard it asserted that those who lived before the coming of Christ so not belong to the church of God! We never know what we shall hear next, and perhaps it is a mercy that these absurdities are revealed at one time, in order that we may be able to endure their stupidity without dying of amazement. Why, every child of God in every place stands on the same footing; the Lord has not some children best beloved, some second-rate offspring, and others whom he hardly cares about. These who saw Christ’s day before it came, had a great difference as to what they knew, and perhaps in the same measure a difference as to what they enjoyed while on earth meditating upon Christ; but they were all washed in the same blood, all redeemed with the same ransom price, and made members of the same body. Israel in the covenant of grace is not natural Israel, but all believers in all ages. Before the first advent, all the types and shadows all pointed one way—they pointed to Christ, and to him all the saints looked with hope. Those who lived before Christ were not saved with a different salvation to that which shall come to us. 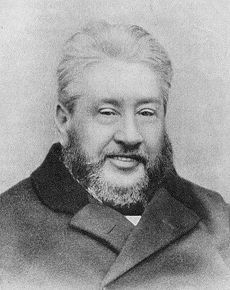 They exercised faith as we must; that faith struggled as ours struggles, and that faith obtained its reward as ours shall.” (From his sermon “Jesus Christ Immuntable” [emphasis from here http://www.spurgeon.org/misc/eschat2.htm ]. For a system that so greatly relies on a supposed literal interpretation, great damage is done not only to biblical theology, but to innumerable passages that highlight the uniting of Jews and Gentiles in Christ. The passage above from Ephesians is one such passage. Just prior to it, in Ephesians 1:1 – 2:10, the Apostle Paul had just outlined God’s plan of redemption “before the foundation of the world” which includes both Jew and Gentile, as Paul, being a Jew, is writing to a Church of Christians, which was likely comprised of both Jew and Gentile. Therefore, his use of “we” and “us” is inclusive of all believers in Christ. However, in Ephesians 2:11 he makes a new distinction and now shifts his focus specifically to the Gentiles. His purpose for doing so seems to be what is missed in the classic dispensational system, primarily a lack of understanding that although national Israel, meaning those born of the flesh of Abraham, were a people chosen by God (Deut. 7:6-7), through whom Christ would come (Galatians 3:16), salvation is not inclusive of them, nor is it exclusive of non-Jews, but rather it is “children of the promise” (Romans 9:8), namely God’s elect, who will be saved. The Apostle Paul wrote of God’s plan of redemption in great detail in his Roman epistle and Romans 9-11 specifically addresses the misconception that somehow race or ethnicity was a determining factor of salvation. Let us not be guilty of this same error, but let us realize that God’s purpose of election throughout history is through His sovereign grace alone and that it is He that chooses to show mercy to whom He wills. Without the fulfillment of His plan in this manner, through predestination and election, salvation would have never come to the Gentiles. All those who repent and bow the knee to Jesus in faith and declare Him as their Lord and Savior will be saved joining the saints of old, the saints of present, and those soon to come into the fold as one body in Christ Jesus, His Bride – The Church. Believer, look back through all thine experience, and think of the way whereby the Lord thy God has led thee in the wilderness, and how He hath fed and clothed thee every day – how He hath borne with thine ill manners – how He hath put up with all thy murmurings, and all thy longings after the flesh – pots of Egypt – how He has opened the rock to supply thee, and fed thee with manna that came down from heaven. Think of how His grace has been sufficient for thee in all thy troubles – how His blood has been a pardon to thee in all thy sins – how His rod and staff have comforted thee. When thou hast thus looked back upon the love of the Lord, then let faith survey His love in the future, for remember that Christ’s covenant and blood have something more in them than the past. He who has loved thee and pardoned thee, shall never cease to love and pardon. He is Alpha, and He shall be Omega also: He is first and He shall be last. Therefore, bethink thee, when thou shalt pass through the valley of the shadow of death, thou needest fear no evil, for He is with thee. When thou shalt stand in the cold floods of Jordan, thou needest not fear, for death cannot separate thee from His love; and when thou shalt come into the mysteries of eternity thou needest not tremble, For I am persuaded, that neither death; nor life, nor angels, nor principalities, nor powers, nor things present, nor things to come, nor height, nor depth, nor any other creature, shall be able to separate us from the love of God, which is in Christ Jesus our Lord. Now, soul, is not thy love refreshed? Does not this make thee love Jesus? Doth not a flight through illimitable plains of the ether of love inflame thy heart and compel thee to delight thyself in the Lord thy God? Surely as we meditate on the love of the Lord, our hearts burn within us, and we long to love Him more.